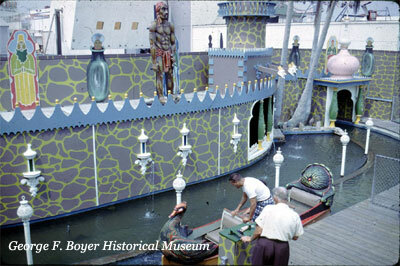 This is how the old mill looked in 1966 when it was themed as Arabian Nights. This picture is from the George F. Boyer Historical Museum and was sent to us by Scott Hand. This is how the old mill looked in 1973 before the Nickels purchased the pier. 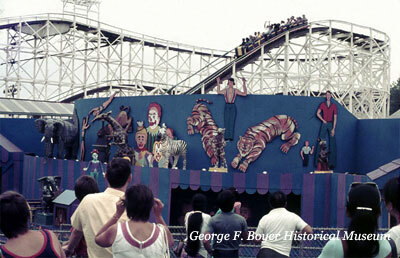 It was themed as a circus ride at this time. The Jack Rabbit roller coaster can be seen in the background. This picture is from the George F. Boyer Historical Museum and was sent to us by Scott Hand. Although the castle was 2-stories high, the upper level was only used as storage. 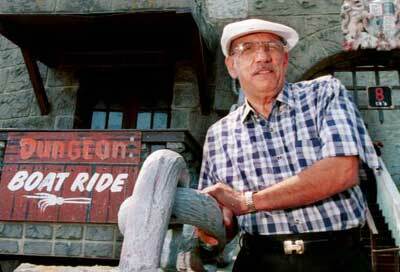 There were plans to make the upper level part of the attraction, but it proved to be too costly for the Nickels. John Nickels stands by the front entrance to the castle. John and his brothers Steven and Angelo, along with Steven's son B.J. Nickels, were co-owners of the Midway Pier. The Nickels family came to the Wildwoods in 1944, opening concessions that provided readings, ball games, and guess your weight stands. The Nickels purchased the western section of the Marine Pier in 1976 for $1,800,000. They renamed it Nickels' Midway Pier and built Castle Dracula for the 1977 season. This photo was taken by Chris Polk in 1999. Castle Dracula met its demise due to arson on January 16th, 2002. Some of the castle's structure and contents survived the fire and were taken as souvenirs by various people. The remaining rubble was eventually cleared away and a trampoline attraction replaced the once great castle. Although the Nickels family originally announced that the castle would be rebuilt, various obstacles stopped that from happening. If you would like to see some Castle Dracula memorabilia, you can visit the George F. Boyer Historical Museum at 3907 Pacific Avenue in Wildwood. Call (609) 523-0277 for operating hours. A picture of the Castle Dracula display in the George F. Boyer Historical Museum on Pacific Avenue in Wildwood, NJ. 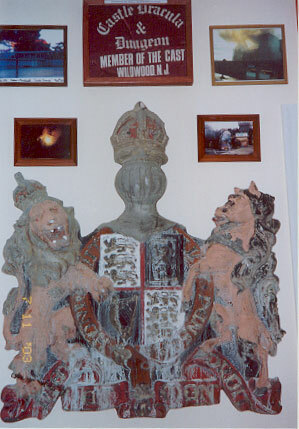 The museum has the original crest that was mounted above the castle drawbridge, along with several pictures of the castle. This photograph of the museum display was sent to us from Mike Vlkovic.